The Waterlase MD Turbo All-Tissue Laser is cleared for a full range of hard-tissue, soft-tissue, periodontal, endodontic, and surgical procedures. For a full list of indications, please contact us. Compared to other dental lasers such as Er:YAG, the unique properties of the Waterlase MD Turbo’s Er,Cr;YSGG laser (2,780 nm) provide the most efficient and comfortable hard-tissue cutting with the least amount of discomfort for the patient. 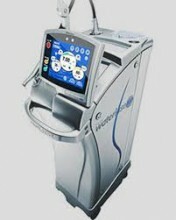 The Er,Cr:YSGG laser also cuts soft-tissue with much less bleeding compared to Er:YAG. Additionally, the Er,Cr:YSGG can perform laser assisted new attachment procedure with calculus removal, and it can disinfect a root canal after endodontic instrumentation. Single-use, disposable tips are also available to eliminate the potential for cross-contamination that can occur in conventional dental burrs. Live, hands-on Certified Training Course and Master Laser Courses are available – please contact us for more details. Click the button below to add the Biolase Waterlase MD Turbo Dental Laser to your wish list.